It’s finally in! ‘Love you to the moon and back’, our dreamy window with stars, clouds and A GIANT MOON, WHAT? Now this window display was debated a lot by everybody in the studio – what size moon? Half or Full Moon? Silver or Gold (note to self Orli hates gold) and is it even Christmas? The answer, yes! Christmas is about magic, creativity, and dreams. This was a very challenging display with determination and lots of laughs. Twinkle twinkle little star! Each star was lovingly cut out and glued together, the stars sparkle in the light and add magic. 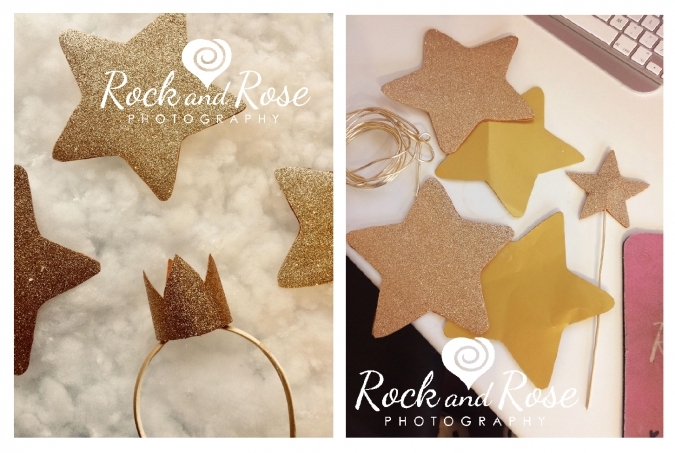 It’s all come together with a lovely mix of glittery stars and golden hues, if you come in for a session with us you’ll see these little stars twinkling in the background of your photoshoot. Additionally we also made a crown fit for a queen and a fairy’s ward to make wishes with to make it extra special. The Moon… well what can I say? (before we start, I’m not tiny… it’s a giant moon) Now this was a mission… firstly we thought MDF would be best however in reality it would be to heavy and difficult to hang. So, Cate came into the studio one morning with an idea – heavy duty paper and card (don’t ask where we found the cardboard). We had a plan in action, so it was off to the shops to buy the necessary tools… glue, spray paint and glitter. I thought I would let Cate have the honour of drawing the moon and cutting out the shape (as I am pretty useless at that stuff) it was my job to keep us going with optimism and positivity! Once cut, we sprayed the entire moon with white gold paint, it didn’t take long to dry. Afterwards we cut the card out for the back, to add strength to it, this is where things got interesting! The lines seemed to keep moving, nothing sat properly and to top it off we were running out of glue… After a bit of a messy job we finally trimmed the Moon and it was looking fabulous again! We can’t wait for the Moon to take centre stage. 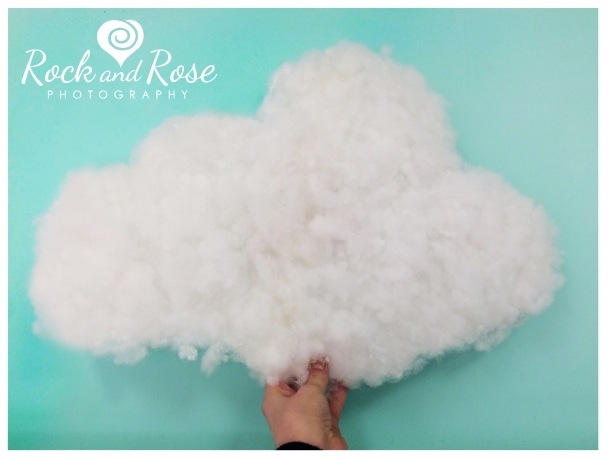 The fluffy clouds- we cut out each cloud by hand and glued the stuffing together. This was more difficult than expected! Cate and I, suffered greatly, little burns EVERYWHERE! As you can imagine gluing fluff isn’t easy, it got stuck to our jumpers, jeans and fingers! I have to be honest, we looked at a few youtube videos beforehand…it’s a lot harder than it looks. Our first attempts just looked like sheep! But we did finally get it right! Practice makes perfect and it’s totally worth it, almost good enough to eat. Come and have a look at our winter wonderland dreamscape and book yourself a magical session. Our Christmas sessions are available for all the family and include a 10×8″ print and a Digital image of your favourite photograph all for £50, call us on 0208 390 5558 to book now. Christmas Fever! »« Feeling blue? New offer is here!